We find out more about unique local business the Magic Hat ahead of their Crowdfunder campaign launch party on Saturday 10th November at Cobalt Studios, Newcastle. We started the Magic Hat as a group of strangers brought together by a passion to do something about the madness of food waste. Lots of us had been living entirely off the delicious, perfectly edible food we were taking out of high-end supermarket bins. Our hauls were ridiculous – think five whole sides of smoked salmon, fifteen joints of top side beef, several wheels of cheeses we could never have afforded to buy. The price tags would usually add up to several hundred pounds each time we went. Even after we shared the food out among all our friends we still had far too much. When we threw the first Magic Hat Cafe pop-up we didn’t even need to go bin diving, though. We spoke to food businesses around Newcastle who were more than happy to give us the food they couldn’t sell, rather than chucking it in the bin. We started intercepting fresh fruit and veg, milk, eggs, even some meat and an absolutely sickening amount of bread – all that was destined for landfill. We now work with many of the major supermarkets, a lot of restaurants, farms, bakeries and charities to make sure the food they can’t sell gets eaten, not dumped. Since we started in 2015 we’ve intercepted 10,500 kg of edible food from landfill for our pop-up cafe and market (not including the food we’ve intercepted for our catering gigs). We take this surplus food and prepare it into delicious, healthy meals in our pop-up cafes. Whatever we don’t cook (we always have too much!) goes on our food market, where people can shop for fresh produce to take home. Our food is always ‘pay-as-you-feel’, which means people can pay however much they want, either with money or by volunteering their time and skills. Pay-as-you-feel means our food is accessible to everyone, so we enjoy a truly diverse crowd at our cafes. 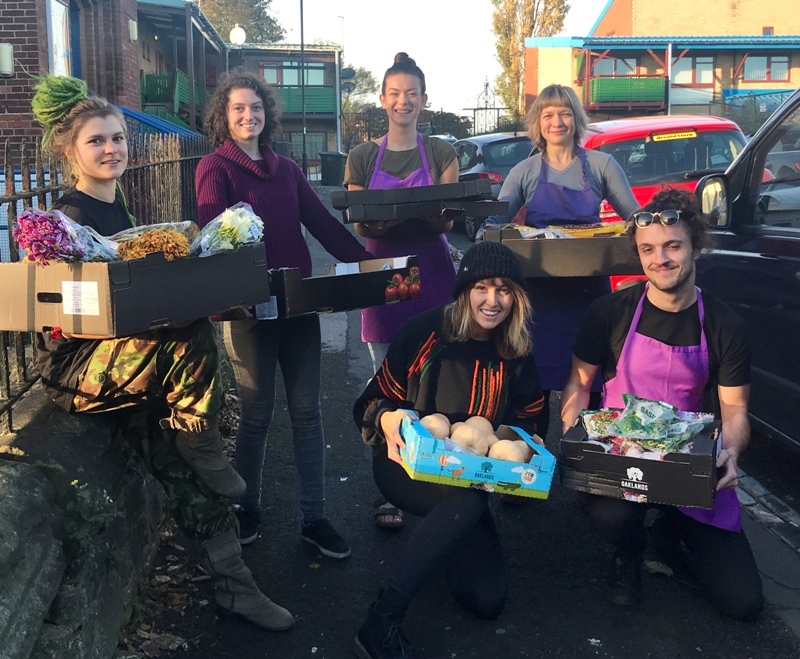 We want to raise awareness about food waste as much as we can so we’ve done these pop-ups all round the city: in bars, restaurants, church halls, parks, on beaches and most recently every Friday evening at Byker Community Centre. As well as the food waste prevention, it’s the community that’s gathered around the Magic Hat that really inspires us – both the people that come to eat at the cafe and use the market, and the family of volunteers on which the success of the project totally depends. Food is a powerful tool for bringing people together, sharing and starting conversation. We’ve been running as a pop-up for over 3 years, and we’re now ready to take a very exciting step forward by opening our own city centre premises. Operating several days per week on the busy streets of the toon will allow us to reach even more people and save several hundred kilos of good food from landfill. We’ll continue to make our space accessible to as many people as we can, somewhere everyone feels at home. In order to cover the costs of fitting out a commercial kitchen, rent for the first year and a living wage for our chef, we need the help of the people of Newcastle. We are crowdfunding for £20,000, so we’re relying on the strong, vibrant community of Newcastle to support us to help raise awareness on food waste in our city, feed more mouths, improve Newcastle’s environmental footprint and bring together more amazing people . So come along, say hello and enjoy eating some delicious food that is too good to waste. We hope you’ll join us there to fight food waste and feed the people!